At a follow-up meeting, held two weeks later, a constitution was officially adopted and officers were elected. 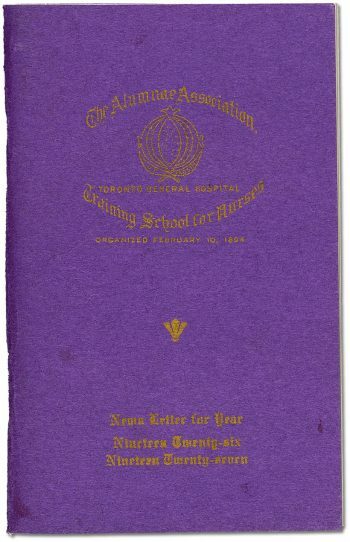 The organization would be called, The Alumnae Association of the Toronto General Hospital Training School of Nurses. 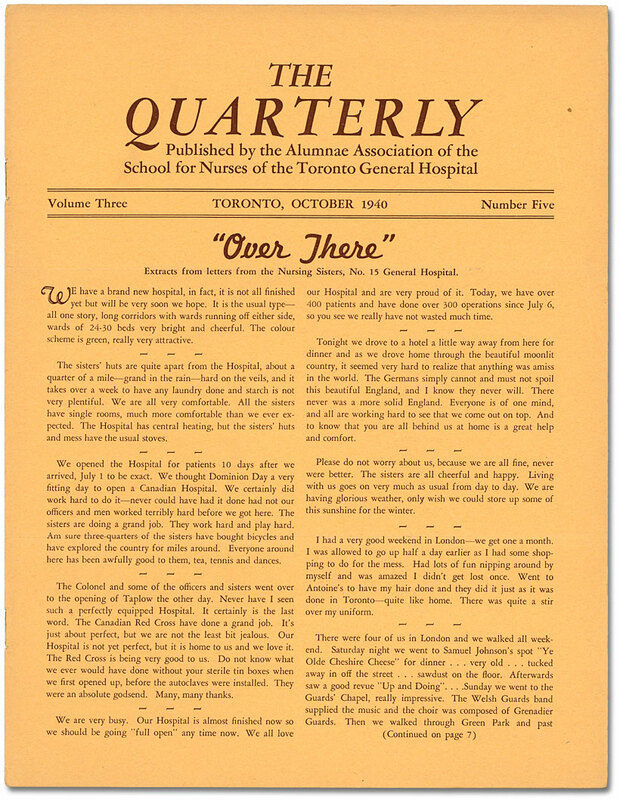 The Alumnae Association progressed and evolved in harmony with the School for Nurses of the Toronto General Hospital, and has been an important and ongoing influence in the life of the graduates. Throughout its 116 year history it has been guided by those original objectives. One of the Alumnae’s first endeavours was to arrange for a Sick Benefit Fund to which members could contribute. Established in 1901, the fund provided members with an allowance during times of illness. In 1903 a special pin was commissioned for the Association. 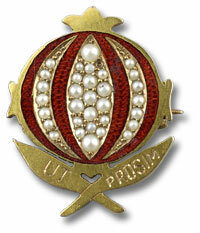 The design was comprised of a pomegranate – a plant used for medicinal purposes – encircled by the words Ut Prosim, which means “that I may be of service.” This phrase became the motto of the association. 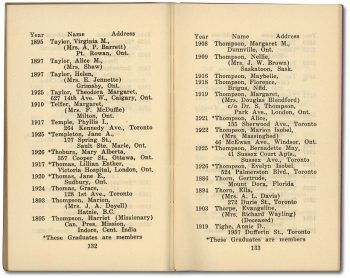 In 1904, the members of the Alumnae helped establish the first professional registry for nurses in the City of Toronto. This registry included graduates from all local schools for nurses. 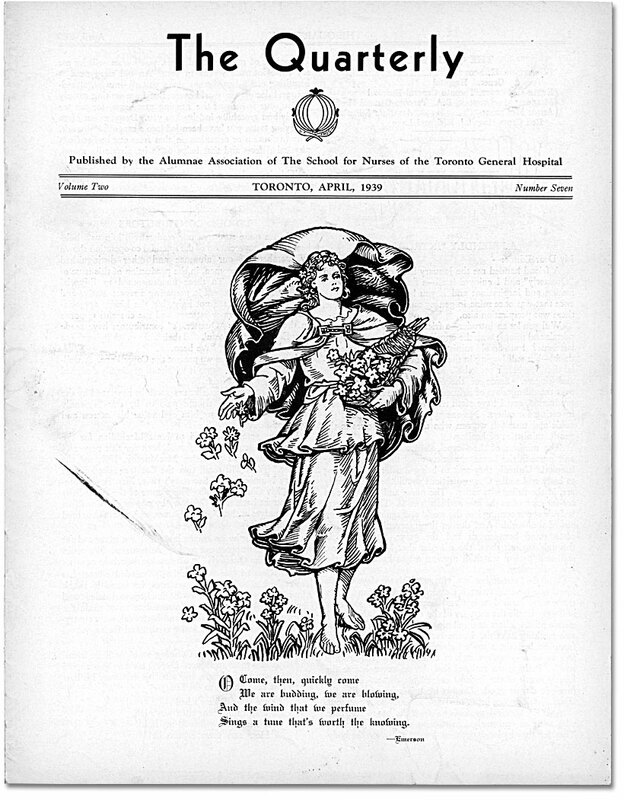 The Alumnae Association also played an active role advancing the profession of nursing throughout Canada and was instrumental in the formation of the Graduate Nurses Association of Ontario (1904), the Canadian National Association of Trained Nurses (1908), and the International Council of Nurses (1909). Part of the mandate of the Alumnae Association was to build a community that would help its members maintain contact with other graduates no matter where they found themselves. This became increasingly difficult as the number of graduates grew, and as nurses started accepting positions in other hospitals, often in distant jurisdictions. 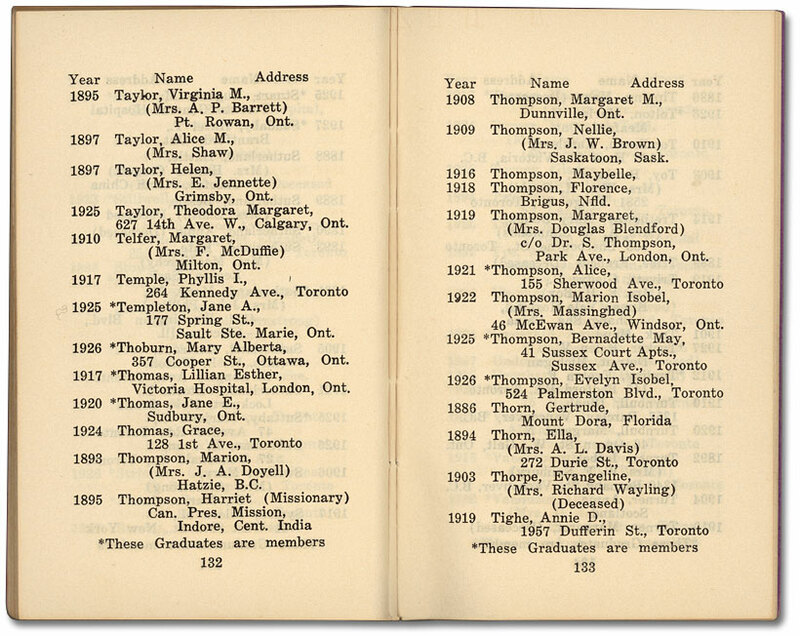 As a result, the Association started printing directories that recorded the names and addresses of all graduates. Long before the days of email, these booklets were vital in helping the nurses keep in touch with each other. The Association was also active in publishing the first issue of The Canadian Nurse in 1905: the early issues of this prominent nursing periodical were published with the financial backing of the Alumnae. The work of the Alumnae was largely carried out by various standing committees. Over the years, these have included: Alumnae Room, Archives, Bursary, Flowers, Gifts, Membership, Nominations, Press, Programme, Quarterly, Service, Social, and Trust Funds. An ongoing activity of the Alumnae was raising money and providing financial support for School of Nursing students, graduates, and the interests of the School. Memorials collected and given by members reflected their pride in the school, residence life and military service. Trust funds were made available to members in need of financial assistance due to illness or misfortune. Annual prizes, bursaries and scholarships were provided to student nurses at the School of Nursing. The Mary Agnes Snively Bursary, for instance, assisted graduates wishing to pursue post-graduate university studies in the field of nursing. The Alumnae also purchased teaching equipment, furnishings for rooms, original portraits and paintings, and commemorative plaques. Of particular note was the founding of the Jean I. Gunn Memorial Library at the University of Toronto, School of Nursing in 1955. 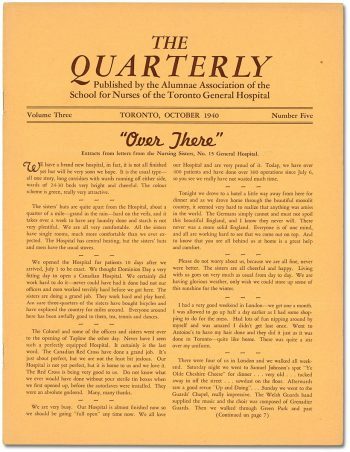 The Alumnae Association’s newsletter The Quarterly, first published in 1935, informed members about news in the field of nursing, the Toronto General Hospital, the School of Nursing, Alumnae chapters, and class reunions. 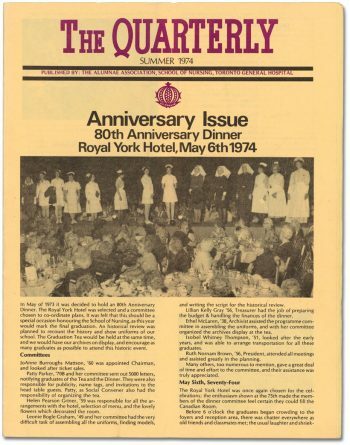 It also provided updates on the graduates themselves, providing news of marriages, deaths, births, and honours nurses had earned. The Quarterly has always been a vital influence in keeping Alumnae members in touch, particularly those in the U.S.A. and overseas. 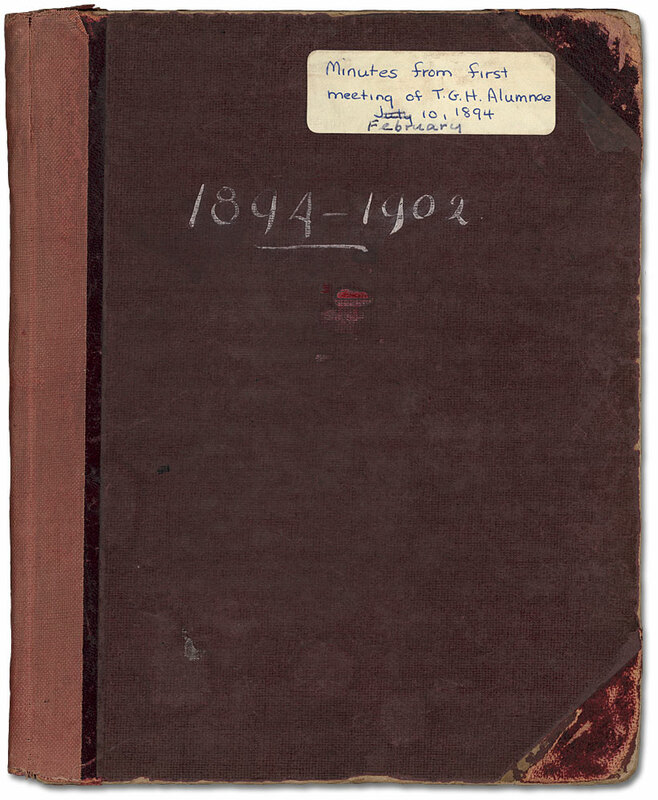 Over the life of the Alumnae Association there were a total of 53 presidents. See a complete list, including the years in which they served. 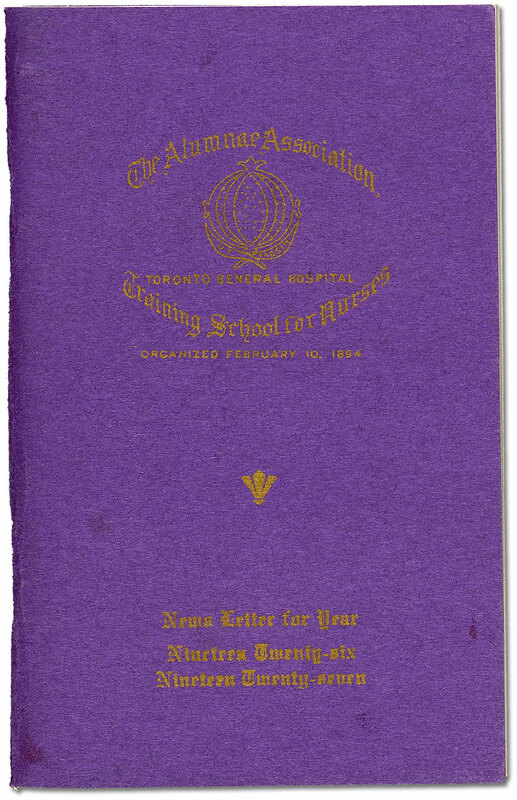 In 1950, the name of the association was officially changed to Alumnae Association, School of Nursing, Toronto General Hospital. The School of Nursing program at Toronto General Hospital was transferred to George Brown College in 1974. However, the Alumnae Association remained active until deciding to cease operations in 2010.